Shanxi Province becomes the 10th province, territory or region in China to report Africa Swine fever since the virus first emerged there in early August, while Liaoning Province adds yet another outbreak to its sizable lead. Two reports today from China's MOA. 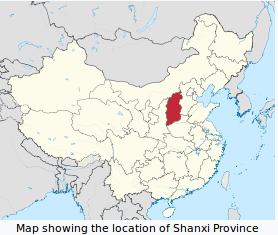 Ministry of Agriculture and Rural Press Office 10 Yue 17 released, Shanxi Province, Datong investigation and the pig disease African swine fever. 10 Yue 17 Ri 12 , the Ministry of agriculture and rural areas to the control center reported Chinese animal epidemic prevention, the China Animal Health and Epidemiology Center (National Center for Exotic Animal Disease Research) confirmed, Shanxi Datong Zuoyun a farmers investigation the African swine fever epidemic. The farmers herds of pigs 15 heads incidence of 7 head and died 4 headers. And this, the 5th outbreak in the past 3 days (see here, and here) reported from Panjin City, Liaoning Province. Ministry of Agriculture and Rural Press Office 10 Yue 17 released, Panjin City, Liaoning Province investigation and the pig disease African swine fever. 10 Yue 16 Ri 20 , the Ministry of agriculture and rural areas to the control center reported Chinese animal epidemic prevention, the China Animal Health and Epidemiology Center (National Center for Exotic Animal Disease Research) confirmed, Dawa District, Panjin City, Liaoning Province, a farming town of Xi'an household investigation and the African swine fever epidemic. The farmers pig herds 161 head incidence of 43 head and died 43 headers. While African Swine Fever has never been reported in North America, its recent geographic expansions in Europe and inroads into China have pork producers around the world on high alert. African swine fever (ASF), first described in the 1920s in Kenya, is a highly contagious hemorrhagic disease of wild and domestic suids with extremely high morbidity and mortality rates. ASF is a notifiable disease with the World Organization for Animal Health (OIE) due to its ability to spread rapidly and cause severe illness. ASF does not pose a risk to public health. ASF is unique, as it is the only known arthropod-borne, DNA virus. The disease is endemic in Sardinia, most countries of sub-Saharan Africa, and some West African countries. Spain and Portugal eradicated ASF in the mid-1990’s; it was also eradicated from the Caribbean following outbreaks from 1977–1980. However, the unimpeded spread of ASF through Russia, the Caucasus and recent introduction into China is cause for concern. ASF has never been reported in the United States, Canada, Australia, or New Zealand.